We invite young people to submit short stories and photos about their experiences out on our preserves (with their parents' permission, of course)! Send your best stuff to info@bangorlandtrust.org for a chance to be featured on this page. July is a month for Birds & Butterflies! Lots of animals build nests. Some are: gorillas, chimpanzees, bees, wasps, turtles, alligators, (dinosaurs! ), snakes, even some fish, and of course birds. Birds nest not only in trees - but on or in the ground, on top of muskrat lodges, in holes in trees, and of course in bird houses people provide for them! On July 20th we’ll be out looking at birds and some of the places they nest. Come join us - we’ll bring the binoculars. Remember: when out in the woods and tall grass of meadows, it’s best to wear long white socks pulled up over your pants - so ticks cannot attach. Check our calendar for all the details of where and when - and then come learn about birds! And butterflies! On July 28th we’ll head out with a butterfly expert to learn about Maine’s butterflies. -Monarch butterflies migrate to Mexico for the winter and come back in spring (over 2,000 miles each way). 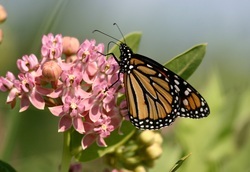 -Monarch caterpillars like to eat milkweed, which makes them taste bad and birds won’t eat them. -Large species of butterflies live longer than small ones. -Many butterflies only live one month, but some as long as 9 months - and most of those we see in our gardens only live one week!. -Butterflies begin their lives as caterpillars - and they eat leaves. -Adult butterflies drink nectar and are attracted to fruit trees and flower gardens. -Butterflies range in size from 1/8" to 12". -Some can fly up to 12 mph (some moths can fly 25 mph). -They can see some colors. -If a butterfly’s body temperature drops below 86 degrees it cannot fly. -Antarctica is the only continent that has no butterflies. Click on http://www.thebutterflysite.com/facts.shtml for pictures and more facts. Check our calendar for all the details of where and when, get out your long white socks, and come join the fun!